Discover the site of a pre-European Native American settlement and permanent area headquarters where Ojibwe bands congregated. Wooden burial structures protect and mark graves of these ancient bands. 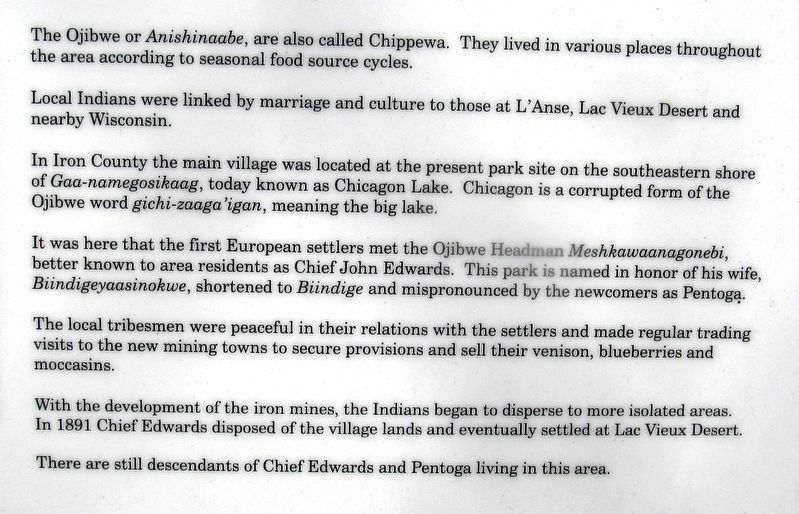 When Chief Edwards moved towards Lac Vieux Desert in 1891, he disposed of these lands with their traditional burial grounds. The county purchased the land in 1924 to develop a park on the beautiful shores of Chicaugon Lake and to preserve the burial grounds as a tribute to Native Americans. The Ojibwe or Anishinaabe, are also called Chippewa. They lived in various places throughout the area according to seasonal food source cycles. Local Indians were linked by marriage and culture to those at L’Anse, Lac Vieux Desert and nearby Wisconsin. In Iron County the main village was located at the present park site on the southeastern shore of Gaa-namegosikaag, today known as Chicagon Lake. Chicagon is a corrupted form of the Ojibwe word gichi-zaaga’igan, meaning the big lake. John Edwards. This park is named in honor of his wife, Biindigeyaasinokwe, shortened to Biindige and mispronounced by newcomers as Pentoga. The local tribesmen were peaceful in their relations with the settlers and made regular trading visits to the new mining towns to secure provisions and sell their venison, blueberries and moccasins. With the development of the iron mines, the Indians began to disperse to more isolated areas. 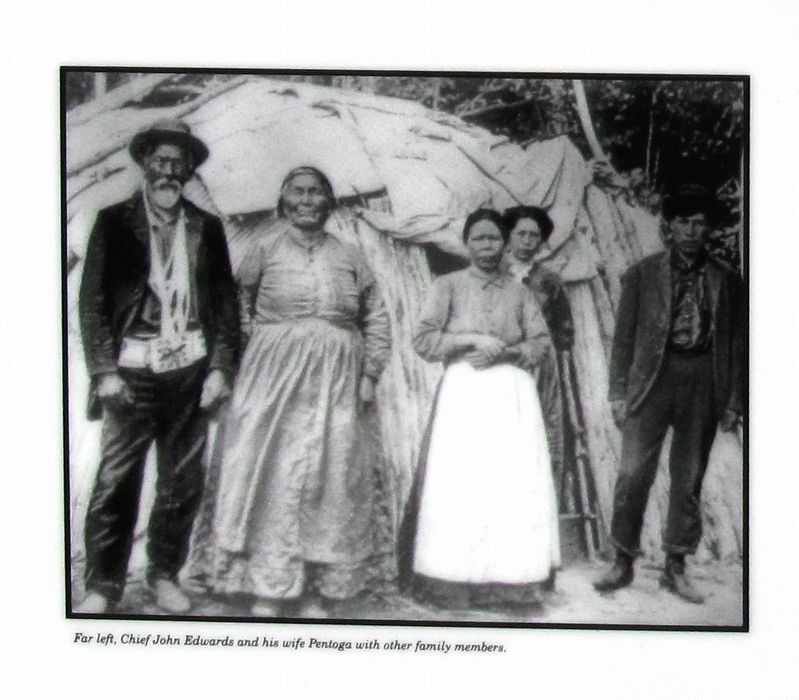 In 1891 Chief Edwards disposed of the village lands and eventually settled at Lac Vieux Desert. There are still descendants of Chief Edwards and Pentoga living in this area. 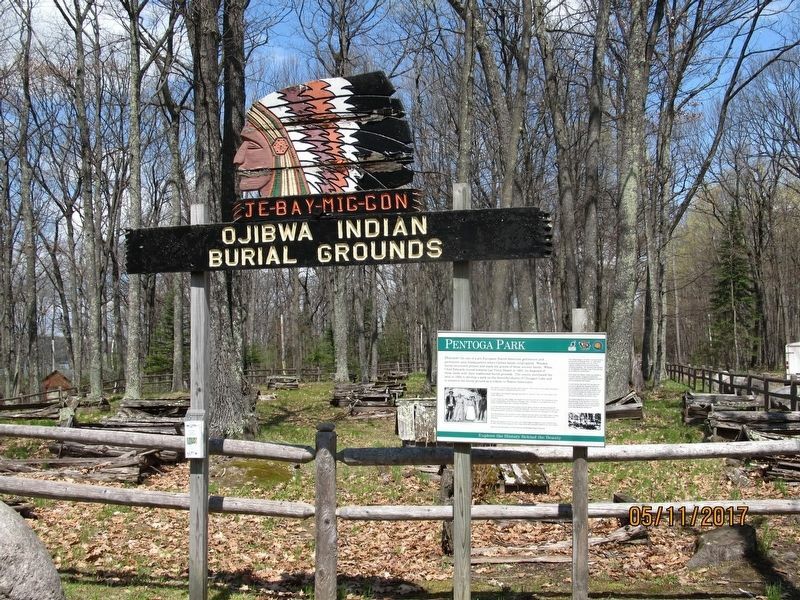 The Jiibegamigoon, an Ojibwe burial ground is located here at Pentoga Park. In 1924 when the park was purchased, only five of the original wooden huts of the burial ground remained standing. The cemetery was located on the Badwater-Chicagon Lake Trail and was surrounded by a brush fence. After death the Ojibwe’s body was clothed in his finest clothes, wrapped in birch bark together with his earthly belongings and most prized possessions and buried. was placed the family totem. 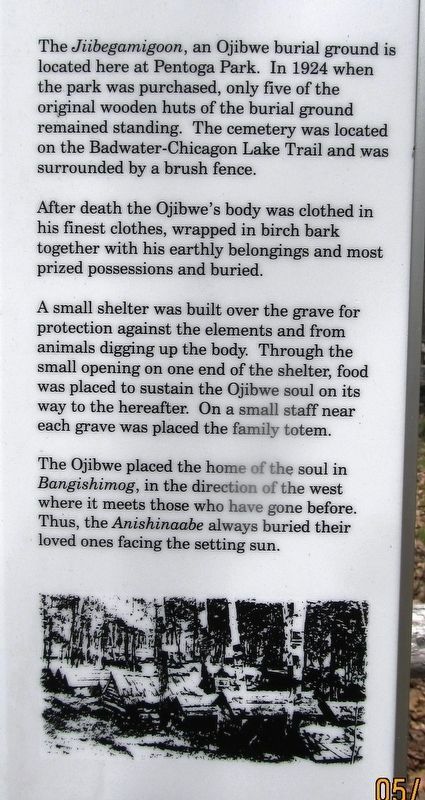 The Ojibwe placed the home of the soul in Bangishimog, in the direction of the west where it meets those who have gone before. Thus, the Anishinaabe always buried their loved ones facing the setting sun. Erected by Iron County Parks, The Chi-cau-gon Chippewa Heritage Council, Iron County Heritage Trail. Location. 46° 2.451′ N, 88° 30.446′ W. Marker is in Stambaugh Township, Michigan, in Iron County. Marker can be reached from County 424 half a mile north of Pentoga Trail. Touch for map. Marker is located in the campground area of Pentoga Park, approximately 9 miles southeast of iron River, MI. Marker is in this post office area: Gaastra MI 49927, United States of America. Touch for directions. Other nearby markers. At least 5 other markers are within 10 miles of this marker, measured as the crow flies. Indian Village (a few steps from this marker); First Roadside Park (approx. 4.9 miles away); Larson Park (approx. 4.9 miles away); Iron County (approx. 9.1 miles away); Iron County Courthouse (approx. 9.1 miles away). More. 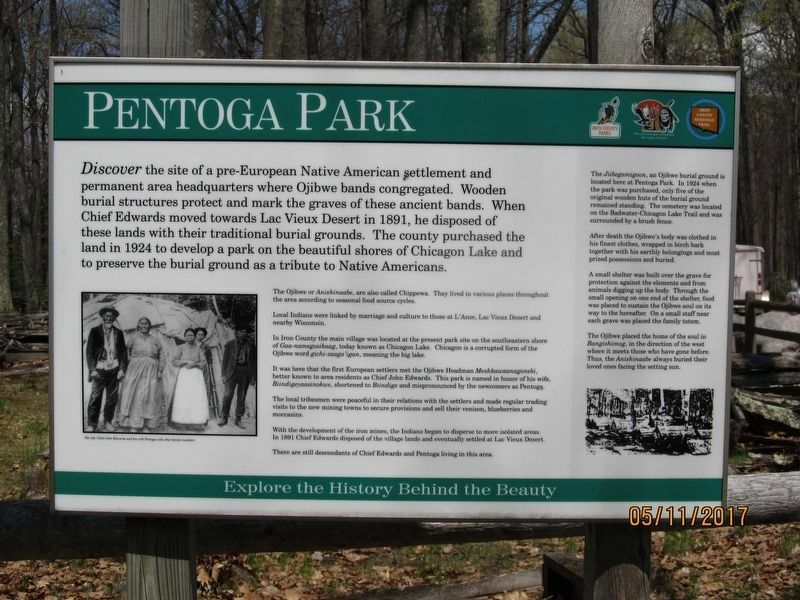 Search the internet for Pentoga Park. Credits. This page was last revised on May 17, 2017. This page originally submitted on May 16, 2017, by Paul Fehrenbach of Germantown, Wisconsin. This page has been viewed 216 times since then and 7 times this year. Photos: 1, 2, 3, 4, 5, 6. submitted on May 16, 2017, by Paul Fehrenbach of Germantown, Wisconsin. • Bill Pfingsten was the editor who published this page.